Rioned’s newly launched compact jetting unit the AquaJet+ Diesel is fast becoming a popular choice with operators looking for a cost-effective, high quality solution. 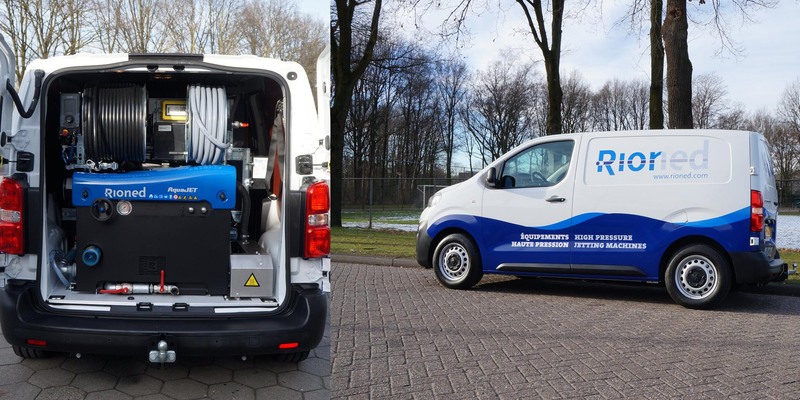 The powerful, lightweight machine can be installed in almost all commercial vehicles, with smaller compact vans, such as the short-wheel based Peugeot Expert, comfortably accommodating the unit and large 600 litre water tank. Weighing in at only 440KG it is also one of the lightest in its class. Suitable for cleaning drains and sewers up to 400mm, the new system is available in 3000psi@12gpm or 2200psi@16gpm versions and was designed as an all-inclusive jetting machine that has the power of Rioned’s Cityjet but with a smaller footprint. The standard package includes a hydraulically driven high-pressure hose reel with 60 metres MaxFlow lightweight jetting hose, and filling reel with 35 metres of hose. The 5-channel radio remote control allows single user operation to control the pump, engine revs and emergency stop, and the standard run dry function has an override facility allowing the operator to use the hydraulic system to retrieve the hose from the drain. Flexibility is also an important part of the design with several different tank configurations available. All models feature the award winning eControl+ user interface. Operated via an easy-to-use jog-wheel, the LCD screen displays full machine status at a glance, including engine status (oil, battery, coolant, temperature etc), run dry protection, service intervals and operating hours.